Republic Day is a public holiday in Nepal that commemorates the creation of the Federal Democratic Republic of Nepal on May 28, 2008. The establishment of the republic put an end to civil strife that had lasted for years. Modern Nepal was created in 1768, when Prithvi Narayan Shah conquered the Kathmandu Valley and formed a unified country from a number of small independent states. In 1846, maharaja Jung Bahadur Rana founded the Rana dynasty that ruled the country until 1951. Prime Minister and other government positions were made hereditary and the monarch had no real power. Dissatisfaction with the Rana regime led to the 1951 revolution which ended the Rana oligarchy. Initially Nepal was a constitutional monarchy, but in 1960 King Mahendra suspended the constitution and became an absolute monarch. When his son Birendra ascended to the throne, he carried out some democratic reforms. In 1991, the first elected government of Nepal in 32 years was formed. However, the new government's policy led to an economic crisis. Civil strife of the early 1990s eventually transformed into a full-scale civil war. 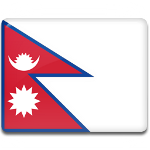 As a result of the war, Nepal was proclaimed a republic on May 28, 2008. This put an end to the 240-year-old monarchy.